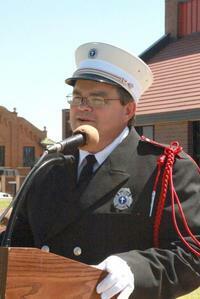 I have had the opportunity to serve as a Fire Chaplain since 1988. My first experience was as a volunteer fire fighter and chaplain with the Mountain View, Oklahoma Fire Department. The Weatherford, Oklahoma Fire Department was my first opportunity with a full time department as a fire fighter and chaplain. Currently, I am the chaplain for the Elk City, Oklahoma Fire Department. I enjoy working with and being involved in the life of fire fighters. I am a member of the Oklahoma Fire Service Chaplains, Inc and the National Federation of Fire Chaplains. Completed Advanced Chaplain status with the Federation of Fire Chaplains. I have been married to Penny (a sixth grade teacher) since 1988. I have a an adult daughter who is married and a Registered Nurse. I am the Director of Missions for the Great Plains Baptist Association. I am a graduate of Southwestern Oklahoma State University in Weatherford, Oklahoma and Southwestern Baptist Theological Seminary in Fort Worth, Texas.